When I was 30 years old the warranty on my body ran out. Systems started failing and tech support wasn't a whole lot of help. Re-booting wasn't an option and calls to the manufacturer.... Well let's just say the‘answers' are still a point of discussion. It's not like it was the‘blue screen of death' or anything, but it is chronic... (Multiple Sclerosis). It has caused me to have a different perspective on most things because where I sit.... is in a wheelchair. Int2view: So Lee, is your hatred of filing really that bad or is it just an aversion? Lee: Let me put it this way, in my world it’s filing, clutter and root canal, in that order. Int2view: (somewhat sarcastically): Oh come on, it can’t be that bad! Did you have a bad experience as a child? Did a filing cabinet bite you? Lee: Sort of. My college freshmen summer was spent working for a large insurance company as a file clerk. This was before desktop computers were around. Int2view: OK, so? Having a summer job that entailed a little filing isn’t that terrible. Lee: Think so? Picture a huge room filled with insurance agents on the phones at their desks. The front of the room was a line of five-drawer filing cabinets as far as the eye could see containing information about all the insurance policies written…ever. Each morning I was given a lengthy list of files to pull and at the end of day the files had to be returned. Int2view: Come on, so you had to file a lot. Was it that bad? Lee: Bad? BAD?? It was repetitive, mind-numbing & manicure destroying! And did I mention the paper cuts?? There’s no workman’s comp for that you know!! Int2view: I get it, so you were traumatized a bit. What did you do? Lee: I toughed it out, but I made two decisions –Never learn to type well (so I would never take a job that required typing), and never put myself in a position where filing was required…ever. Int2view: So how’s that working out for you? Lee: Who knew that computers would take over the world? I type constantly. But it’s not bad. I work at my own pace and haven’t worried about spilling white-out in years. Lee’s review of NeatDesk from the Neat Company begins here. Eliminating Office Clutter…or… What’s a 4 letter word that begins with ‘F’? File, I hate to file (what did you think the word was….shame, shame). I don’t know about you, but our office is swimming in paper! There are invoices, receipts, vouchers, itineraries, stubs, business cards and small mountains of unidentifiable, slightly crumbled ‘these are really important’ papers. Today’s computerized world has changed the way we do things….a lot. Email has caused the US Post Office to see (and bleed) red, taking notes involves a keyboard and we constantly hear talk of the paperless office. HAH! Our office keeps records for three companies, investments and personal information. This results in something like the image at right. It made sense to use computer tech to ease being overwhelmed by paper documents, so I began scanning the mountain of paper that comes across my desk into PDF (Portable Document Format) files and saving them to folders on my hard disk. I thought it was a pretty good way to do the filing (ugh, that word). One problem, nobody else could figure out my system. There had to be a way to organize and make sense of all the paperwork. The answer to my predicament arrived when the Neat® Company sent us the NeatDesk to review. There are two components to the system, the scanner and the digital filing software. The high-speed duplex desktop scanner is fast. It has a patented ADF (Automatic Document Feeder) with specially sized slots to process 10 documents, 10 receipts and 10 business cards in a batch. When the tray is removed it can handle large documents of up to 50 pages. We received an early release of the Neat V5.0 software for review. “Neat 5 software uses patented "Intelligent Text Recognition" technology to identify and capture key information from scanned documents”. The new revamped user interface (The Dashboard) is terrific, providing an easy, logical way to process, display and access the information in the system using a filing cabinet, drawers and folders metaphor. The Dashboard has all the information you need to get started and maintain the system. The left panel lists the contents of the filing cabinet (more on that later), the center area contains a video demo on how to get started and resources including a community link, a help center and additional video tutorials (very useful). The right panels show statistics regarding how many folders, receipts, documents and contacts have been entered into the system. Another area also displays the searchable contacts database. This is how we got started. First we made some popcorn. Next, we viewed several tutorial videos. We formulated our organizational game plan and went to work. In the “My Cabinet” area, we set up the “drawers” we normally use – i.e. one for each company. Then we created Sections in each drawer (i.e. 2010, 2011 and 2012). Within each section we created folders to hold the related information. As items were scanned or imported, additional folders were created as needed. We quickly and easily processed all the documentation, confirmations, receipts and business cards from our test case, the trip to CES 2012 in January. Simple answer – Import them into the logical, intuitive system created in Neat® 5. It was truly “point and click” to determine what to import and where to put it. At first, I did one group of files at a time to insure placement into the proper folder. I quickly realized it would be faster and just as accurate to select a whole bunch. The files appeared in the “Recently Added Items” link on “The Dashboard” and were marked “Unreviewed”. I then verified the information in each item and put it in the correct folder. I used the settings menu to customize fields and columns. Like I said – simple! The dashboard displayed that we had 369 folders, 127 receipts, 566 documents and 564 contacts (426 synched with Outlook). Among the features we like is the option to select “Send to Neat” from the print menu in any application, rather than having to save as a PDF and import to Neat later. The ability to search the entire database and find what we need in seconds adds even more efficiecy, saving time and eliminating frustration. Data can be exported to applications such as Outlook® and QuickBooks®. The option to export to TurboTax® can ease the process at tax time. The ability to create reports for expenses makes it easier to manage business and personal expenditures. No more excuses such as “I don’t know where the receipt is.” We successfully tested sending information to Excel®, Quicken©, and QuickBooks©. As with any new system, it took time to initially set up the folders so the key information could be extracted and organized. Once done, the information is searchable and can be used to generate reports utilizing the Report Creator Wizard. The Report Wizard made it a breeze to produce a wide variety of reports using all the information entered in the system. Neat® is great at providing technical support with video tutorials, solutions and access to a community of users. The Help Center provides answers as well as the ability to create an account to keep a log of your support issues. The software license allows for installation of NeatWorks on two computers. Each computer maintains its own database. Currently, NeatWorks cannot be configured to share a database over a network. Now that my desk is clear, I don’t pale at the thought of handling incoming mail, finding filed information or facing the accountant at tax time. We look forward to seeing a network capable version. At CES 2012 Neat® Company announced NeatCloud and NeatMobile to provide users with broader access to their information. Release date is anticipated late Spring. NeatDesk and NeatReceipts (a portable version) are available for Windows and Mac. Check the Neat® Company for deals. Like many of you reading this article, I am the proud servant of a Smartphone, a tablet, a laptop and a desktop computer. They keep me pretty well tethered to my work, my friends and the Internet. The problem I have is staying tethered to them. Manual dexterity and grip are not strong suits for people with physical challenges. In fact, I have been told to stay a minimum of 10 feet from my computer keyboard when drinking coffee. I’ve Only Got Two Hands! I'm no different than anyone else. When I'm moving around I want to use my Smartphone or tablet. The problem is that one hand is usually busy maneuvering the joystick on my power wheelchair. This presents me with a real problem when trying to hang on to my technology. Yeah, the walls, furniture and people I’ve impacted (literally) put me at the same risk level as texting while driving. Necessity Can Be a Mother…. The CellHandle™ is a simple thingamabob that attaches and detaches to your phone and many other handheld devices. You attach the self-adhesive base to the phone, wrap the soft Velcro adjustable strap around any finger and you can use your device without fear of dropping it. You can also use it as a kick stand for easy viewing. The CellHandle rotates 360⁰ and can easily fit in your pocket. I use it on my cell phone and my MP3. My personal favorite, the e-Handle™ gives me a secure grip on my tablet/e-reader. The 360⁰ rotation comfortably adjusts to my hand whether I’m leafing through a book, browsing the Internet or taking my frustrations out on Angry Birds™. Using the e-Handle™ allows me to use my device longer and with less hand fatigue. It also helps insure its survival as I go cruising around – one hand on the aforementioned joystick. ScottPaul Technologies has successfully addressed a need benefiting anyone with a mobile device; even a kid who can’t seem to hold on to his stuff, a teen who seems to have grown a new appendage shaped like a cell phone or the physically challenged. The ease I get with the e-Handle™ on my tablet allows me to read at a pace I haven’t enjoyed since holding a hardback or paperback book became difficult. The gift certificates I’ve been hoarding are now putting a dent in the ebook market. We especially like that the product is made in the USA. A recent news broadcast blared a headline warning us against TSS - Toasted Skin Syndrome. We laughed and thought the reporter was just doing a lead in for some video we’d end up seeing on YouTube™. Further research revealed a real condition as reported by NHS on 10/01/2010. Apparently that warm and toasty feeling you get on the top of your thighs when you use your laptop is exactly that! It’s warm alright, and it's slowly toasting your legs! Although I spend most of my computer time at my desktop PC, I rely on my laptop to continue working when I’m mobile or need to get out of my wheelchair and get more comfortable. We received the Logitech Speaker Lapdesk N700 to review and I grabbed it. I wanted to see how it would meet my needs. I wasn’t expecting much… – OK.. yes I was. Given my physical challenges I spend the vast majority of my time seated. When I can’t work at my desk, my lap becomes my desk. To me a lap desk is a must and therefore I tend to be a bit discerning (picky?) when it comes to things like usability, comfort and convenience for potential hours of use. The Logitech Speaker Lapdesk N700 gives me what I need and more…with one small exception. When the 9" Color Multimedia eReader from PandigitalTM with Android Operating System arrived at our offices it caused a small skirmish to break out. Everyone wanted to test it. I, having no shame, played the disabled card and got it. As an avid reader, I wanted to see if the product was just another eReader with a big screen or something more. It's definitely more, so much so that it caused confusion with my expectations. It's name, the PandigitalTM Novel makes me think eReader, but its caption, a 9" multimedia eReader, is much closer to the truth. You see, it has a 9" full color touchscreen display, a stylus for ease of navigating and Android OS 2.1 enabling the download and use of numerous APPs. This kept making me look at this as a full tablet. It's not....but it's awfully darn close. By the way, it is only 1/2" deep and weighs 20.5 ounces making it comfortable to hold. The eReader's 9" TFT-LCD (Thin Film Transistor-Liquid Crystal Display) touchscreen has a 480 x 800 pixels resolution. While not the highest resolution on the market, we found it more than adequate for the tasks we gave it. The G-Sensor easily goes from portrait to landscape mode. The 2 GB internal memory is enhanced by an SD (Secure Digital) card slot that can handle up to 32GB which is certainly enough to hold books and much more. We returned from the CEA Line Show having seen some interesting and innovative products. Among them, a simple but effective aide for a common problem we all face at one time or another – trouble sleeping. At the end of the day, sleep is what I want but thoughts and ideas are what I get. My answer is to meditate. I found that to get to that place of total relaxation it helps me to have the right soundtrack as a guide. Recordings with a binaural tone do the trick for me. It is, however, quite awkward – to try to sleep with earphones stuck in my ears. AcousticSheep, LLC, a Pennsylvania eco-friendly and socially conscious company introduced SleepPhones™ Pajamas for your Ears. Developed by Wei-Shin Lai, MD a family physician that experienced problems going back to sleep after late night patient calls. Her husband suggested listening to binaural beat frequencies that drive brain activity into a specific brain state. This, however, can only be achieved using stereo headphones. The dilemma – how to listen to the sounds comfortably all night? Let’s face it, even really good earbuds or earphones can become a little bothersome when worn for 8 hours while trying to sleep. Having a similar situation in that I enjoy listening to meditation music at night to get me and keep me asleep, I have gone through many sets of earbuds and earphones. I was looking forward to using the SleepPhones™. 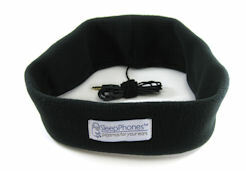 The SleepPhones ™ came in an eco-friendly paper bag labeled with a sleeping lamb wearing headphones. In the bag is a 21” soft stretch fleece band in a lovely lavender color (don’t worry guys, it also comes in grey and black) with pockets for two 32 Ohms 20kHz speakers and a 48” cord with a ⅛” stereo plug that plugs into your MP3 player, IPod or almost all audio devices. The system is useful for drowning out other noises such as snoring (his not mine) or ambient traveling ruckus. It even plugs into the audio channel on an airplane, assuming that your airline still provides music (or anything else for that matter). Pull the headband down over your eyes and presto – a sleep mask. As for acoustics, surprisingly good. Excellent in fact. The compact speakers are full range and when snuggled comfortably on your ears, deliver a clean, precise sound experience. Packaging on our review set was definitely geared to the female demographic. Besides all of the cuddly sheep imagery, the contents even included a lovely aromatic sachet. This might not scream ‘manly’ to your guy, but be careful, if he tries them you may have a hard time getting them back. My husband gave them a whirl and couldn’t stop talking about how good the acoustics were….and he’s very fussy about his tech. My testing of the SleepPhones was a very positive experience. They deliver not only excellent audio but also exceptional comfort. Sheep everywhere should take note! 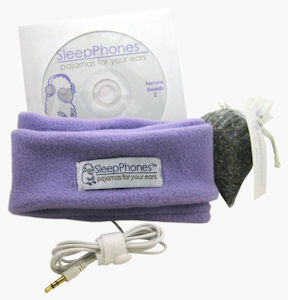 I would give the SleepPhones product 4 out of 5 sheep…uh stars. The only thing that would make it better were if it were wireless….but that would add to cost! The company calls them Pajamas for yours Ears; I say they are a Lullaby For Your Mind. Are Your Arms Getting Shorter?